Rick McGowan's granddaughter was only 2½ years old years old when she became the impromptu poster child for the campaign to gain access to Stoney and Minnie fishing lakes. 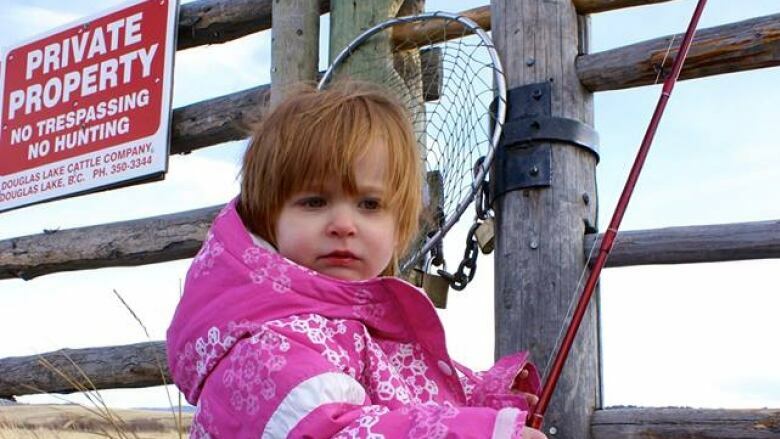 Rick McGowan's granddaughter was only 2½ years old when she became the impromptu poster child for the campaign to gain access to Stoney and Minnie fishing lakes. 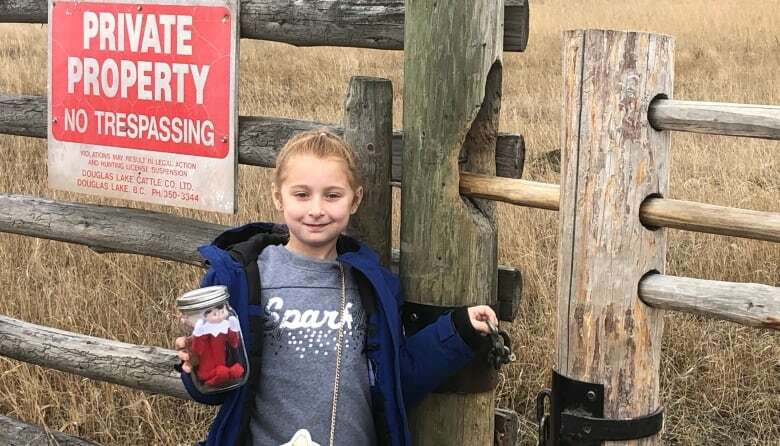 Her grandfather had snapped a picture of her, fishing gear in hand, standing at a locked gate which blocked the only road leading to the lakes in the B.C. Interior. On Dec. 14, McGowan, his wife, and his now eight-year-old granddaughter returned to the exact same gate — except this time it was unlocked. Last week, a B.C. Supreme Court ruled that the public should be able to access the two fishing lakes near Merritt, B.C., about 90 kilometres south of Kamloops. It had been an ongoing battle to visit the lakes because the Douglas Lake Cattle Company, a large working ranch that owns the land surrounding the lakes, claimed that they were private property. The ranch erected gates on the roads leading to the lakes, blocking public access. Rick McGowan was at the forefront of the charge against the largest cattle farming ranch in western Canada — and he won. 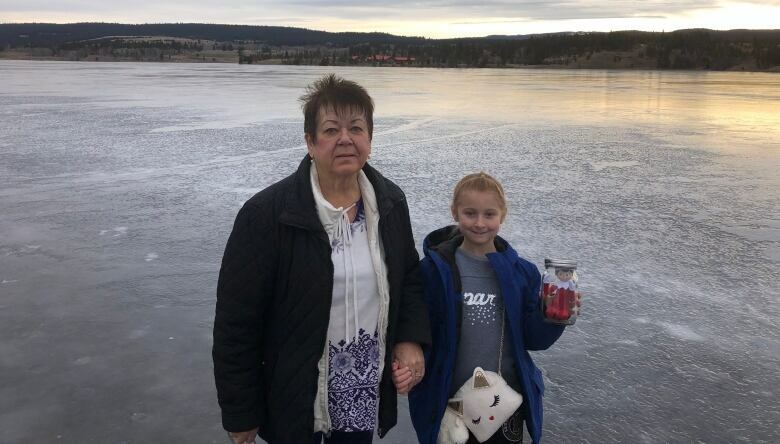 "I got a picture of my wife and [granddaughter] standing on the ice at Stoney Lake and it's been almost 20 years since we've been allowed to go there," said McGowan. "It was kind of special." McGowan says he's been fighting for access to the lake ever since he was first denied in the 70s. McGowan says members of the community would walk up to the lake to take part in what he calls "fishing protests." He says he first took the picture of his granddaughter in 2012 when, along with the Nicola Valley Fish and Game club, he was petitioning the B .C. government to look after the interests of B.C. residents and to open the road. "They denied or refused to acknowledge it was a public road. So then we filed the lawsuit," says McGowan. Now, McGowan can once again enjoy the lakes. "It was just unbelievable to finally go up there. There was nobody around. We just stood there for a while. We revelled in it. Then we turned around and came back," said McGowan. McGowan says that throughout the trial, he received many letters from people across the province who were experiencing the same problems of companies claiming public lakes and roads as private. "We're hoping that this case will sort of set a precedent that the government might finally say 'we better start looking at these road closures and blocking public access because we could be in court forever,'" says McGowan. He says that in Merritt alone there are around 30 lakes where road access is being illegally blocked and many more across the province.